An Ancient Solar System...: Answers for authors: What were the cosmic dark ages? Answers for authors: What were the cosmic dark ages? 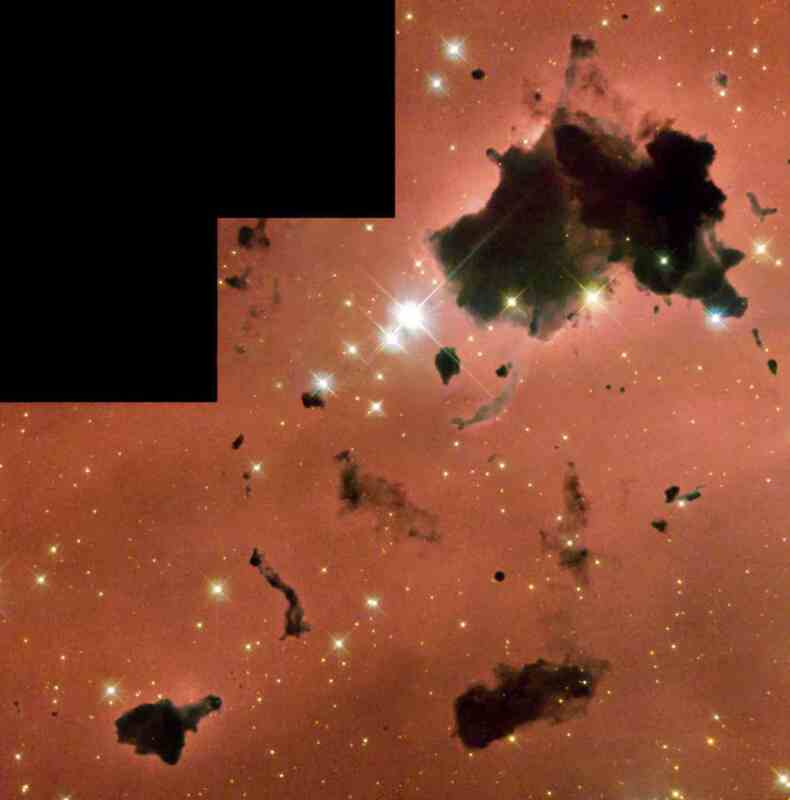 Above: Bok globules, the cocoons where new stars are growing, are one of the few places the conditions of the cosmic dark ages are closely (although imperfectly) replicated today. It's 4.5 billion years ago. The energies of the big bang have faded, and the first stars are yet to ignite, so the universe is... dark. Which is why, with great logic and a nearly terminal lack of imagination, cosmologists call this period of the Universe’s existence ‘the dark ages’. What if I were to hop in a time machine and visit? Is utter darkness all there is to it? The first important difference, and I might well find it's of terminal importance, is the temperature: Unlike today's universe, which has a temperature barely above absolute zero, in this time it’s warm to hellish – ranging from thousands of degrees Celsius to perhaps minus two hundred (still warm by the standards of space), depending on exactly when in the era I’ve arrived. The heat is left over from the big bang - in fact it was still hot enough to boil water 150 million years after the big bang happened. Once it's cooled to modern temperatures it will become the cosmic microwave background, but until then it's just plain scorching. The utter darkness. Yes, I covered this with 'the dark ages' but it bears repeating: The sky is, to all intents and purposes, perfectly black. It’s possible there are some dimly glowing objects out there, as the compressing clouds of gas in the proto-galaxies heat up, but they are shrouded behind those same clouds. There’s nothing solid, anywhere – no stars, no planets, not even any dust (which is made in the atmospheres of elderly stars). This a Universe of hydrogen and helium gas, and very little else. In fact there aren't even any of the chemical elements that make solid matter - most of these are cooked up in the cores of the yet unborn stars. According to some theories there will be a lot of small black holes - some no bigger than an atom - flying around. They were created by fluctuations in the density of the Universe less than a second after the Big Bang, and by modern times all but the biggest will have decayed away or merged together. So this is a universe still under construction and most of it is just dark and hot... but, towards the end of the dark ages, the temperature was below the boiling point of water, yet still above its freezing point. Called the ‘Early habitable Epoch’ the whole universe was a warm dark cauldron in which the laws of chemistry could run the kind of chemical reactions thought to lead to life - perhaps giving rise to early, alien life, or perhaps just setting the chemical stage for life in the universe today.